Today I’m super excited to announce our new beauty editor….Danielle Shine! Danielle is a Natural Foods Chef and Health Coach who specializes in making DIY beauty recipes. She’ll be sharing her talent with us here at KrisCarr.com—and I’m so excited to have her on board! This week, Danielle will be showing us how to use common kitchen ingredients to make our own beauty products and skincare at home. How cool is that? While you’re whipping up that morning smoothie or healthy dinner, why not add some skin and haircare recipes to the menu too. Having just spent a small fortune on the latest n’ greatest brand-name skin care products promising to make my skin look clearer, glossier, brighter, healthier, *insert-more-desirable-words-here* I did NOT want to hear this news, but boy am I glad I did! I’d just scored the job of all jobs: I was a fashion PR girl in London, destined to live a life FILLED with glamour, style and sophistication! 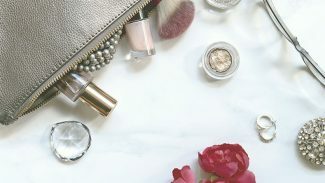 Only… I wasn’t feeling so fabulous because my skin was constantly dry, dull and flaky—prone to breakouts any day of the week, usually right before important meetings, first dates and anything remotely exciting requiring me to look and feel my absolute best. The day I received this advice had been a long one. I was tired and desperate to go home and scrape off the thick-as-cement foundation I’d applied that morning to hide all the multitude of issues I was dealing with underneath. I had one more meeting then I was done…That was THE meeting that changed the skincare game for me! 2. Go back to skincare basics by ditching expensive products in favor of more natural, gentler and more effective solutions often found in my kitchen cupboards! If you’re a chocoholic like me, you’ll already know this healthy fat-filled plant butter is the main element you need to create a healthier version of your favorite chocolate bar, but did you know cacao butter is also used in MANY beauty products like body lotions, lipsticks and face creams? Cacao butter is included in mainstream beauty products because it soothes sensitive skin and helps reduce inflammation. Rich in vitamin E (far more than shea butter, another common ingredient used in commercial moisturisers and stretch mark creams), cacao butter also contains Vitamin K and health-supportive fatty acids including oleic, linoleic, arachidic and palmitic which lubricate the skin, forming a protective healing layer to lock in moisture and promote healing. Warm a little in your hands and massage it into arms, legs, elbows – anywhere you need extra moisture! Break off a 1-inch piece and drop it into your next bath. The hot water will melt its buttery goodness which can then be absorbed into the skin, leaving it silky smooth minus any synthetic chemicals! Most commonly known as the sweet-smelling, deliciously-decadent oil that complements MANY real-food-recipes, coconut oil is truly the gift that keeps on giving. Thanks to its potent antioxidants, antibacterial properties and moisturizing fatty acids that possess potent disinfectant and antimicrobial properties, coconut oil possesses the power to moisturize, safeguard and help skin heal FAST! A little goes a LONG way, but have fun experimenting its effectiveness via the suggestions below. Massage 1 teaspoon worth onto skin before shaving. Using coconut oil in place of overpriced chemical-laden shaving creams is a much safer, more simple and sterile way to nix unwanted hairs on your body while moisturising those areas too. Massage 1-2 teaspoon/s over makeup, following with a warmed facial cloth to easily, effectively remove every last bit of the day—including all the microscopic grime, bad bacteria and dirt build up that naturally accumulates on your skin. A great health-supportive oil to move from your kitchen to the bathroom to take advantage of its many healing benefits. Sweet almond oil is packed with vitamins E and A, monosaturated fatty acids, protein, potassium and zinc that support, strengthen and soothe skin FAST. When applied topically, the Vitamin E in sweet almond oil helps promote softer, smoother looking skin. It also aids in protecting the skin by actively reducing free radical damage that contributes to premature aging. Vitamin A is often celebrated for its effective wound healing abilities. Aside from its powerful ability to reduce acne, it also supports production of collagen responsible for keeping skin supple and wrinkle-free. Dark under eye circles BE GONE! Gentle massage 2 drops onto the skin around your eyes, using very light touch, two to three times throughout the day and watch the darkness turn to light. Want longer, more luscious lashes? Combine 1 teaspoon sweet almond oil with 1 teaspoon castor oil, find a spare mascara wand and paint on this magical mixture before bedtime. Got organic vanilla extract? Don’t just use it in baking! Vanilla extract has long been used to reduce skin infections and support wound healing. It houses potent anti-inflammatory properties that help soothe irritated skin and provide protection from free radical damage. It also contains essential B vitamins including niacin, thiamin, riboflavin, vitamin B6, and pantothenic acid which (internally and externally) help maintain healthy-looking skin. Ditch synthetic, chemical-laden perfumes and create your own instead! Combine 1 tablespoon of vanilla extract with 2-3 tablespoons of sweet almond oil (depending on your preference of scent) in a darkened spray bottle which will keep it fresher for longer—up to 6 months. Shake well before each use and spray on pulse points for best results. Create a delicious-smelling, antioxidant-rich bath by blending 1 tablespoon vanilla extract + 1 cup oatmeal + 1 cup water + ½ cup baking soda. Pour this sweet-smelling paste under running water to infuse into your bath. The oats will soothe dry, itchy skin while the baking soda will help to remove bacteria and any odours from the day. Most commonly used as a thickening agent in liquid-based foods like soups, sauces, gravies, custards and yogurts, cornstarch can also perform a variety of helpful beauty roles too. Given its main role is to absorb moisture, it’s best used in place of things like talc powder and dry shampoo (when paired with a little baking soda). A little sprinkled directly onto an unruly knot will help to lubricate the fibers of your hair, making it MUCH easier to manage! Weird but true, this yeast-y beverage makes the BEST rinse and setting lotion for your luscious locks (your hair!). Best used when flat not fresh, the sugar and protein in beer work to thicken your hair, so the next time someone offers you a ‘cold one’, say yes, open it up and leave it for a couple hours, then *BOOM* hello amazing hair treatment! Oh, and ladies, do NOT worry about any weird beer smells, the odor disappears as soon as your hair dries, I’ve tried and tested it. Was it just me who jumped on the bandwagon of adding liquid chlorophyll to water a few years ago or did you do this too? Back then it was quite pricey, though nowadays it’s much cheaper and easier to find. Essentially, chlorophyll is to plants what haemoglobin is to blood: an extremely VITAL part of healthy (plant) life. Aside from it being a great addition to your diet, it makes for a wonderful antibacterial, anti-inflammatory toner for your skin also! Apply a little on a cotton bud and pat onto any areas that may need a little extra love and attention – chlorophyll is an excellent wound healer. Your turn: Did this article inspire you to try this at home? Let us know! And if you’re already tinkering with making your own beauty products, tell us about it in the comments below. We’d love to try them out! P.S. 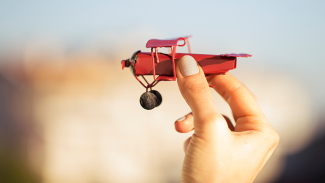 Want to shift from ordinary to extraordinary? 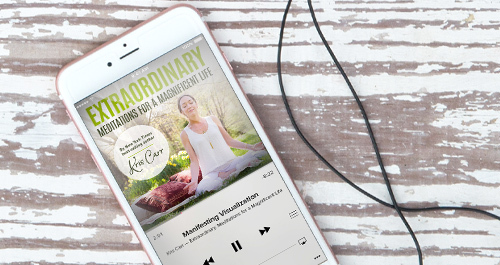 Try my new album Extraordinary: Meditations for a Magnificent Life to help you step into your power and fall madly in love with gorgeous you. Check it out! So excited to see this…I’ve been following Chef Shine for. Long time and love her!! I use many of these ingredients at home but didn’t know about the vanilla extract. 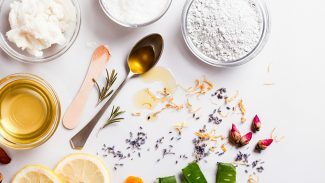 As a health and beauty blogger I am fortunate to try some wonderful natural skincare , but there are so many things you can make yourself at home. Fun to learn something new and I look forward to hearing more from Chef Shine. These are great! I’m allergic to a few chemicals that are in almost all the traditional skin care products and shampoos., so always looking for ideas for substitutes. I’d love to hear some ideas on shampoo. Hi Chris! Shampoos are notorious for housing hidden chemicals that can mess with our immune system. Aside from my simple-but-effective No Poo Shampoo recipe Kris has already linked you to, I recommend looking for brands offering products free from: SLS, parabens, dyes, gluten, artificial colors, iodine, glycols, sulfates, artificial fragrances, phosphates, pesticides and of course, animal testing. Hope this helps! Good info but would love recipe for moisture lotion for face or how to create your own foundation that is healthy for your skin..
Hi Pam, great ideas for possible future posts perhaps! I’m currently playing around with making more health-supportive foundations, so stay tuned! And in terms of a good face moisturizer, you can simply use a high-quality organic jojoba oil (I like the Naissance brand). A few drops are all you need to maintain healthy pores because jojoba oil is such a close match to the sebum (oily substance) our skin naturally creates! Woo hoo! WE LOVE CHEF SHINE!! Mum and I first saw Danielle speak at a health event in London a few years ago, we’ve followed her ever since. It’s so cool to see her writing for you Kris, good on you for supporting someone so caring and genuine. I had no idea half our kitchen cupboard was re-useable in the bathroom, epic, seriously. I have the dryest elbows and am sat here now rubbing in cacao butter, SO AMAZED at how good they feel already – Danielle YOU ROCK!! Thanks to both you Kris and Chef Shine, mum and I have switched from junky diets to eating more plant-based meals. Mum is no longer a type 2 diabetic (go mumma!) and we both feel so much happier in our skin. THANK YOU!! Wow!! Thank you soooooo much for those easy fun tips! Thanks Kris: So helpful, as always. Can you make share some info about deodorants? Brands, etc that are safe- knowing aluminum not the best option. Thanks! Great share Zoey, this article really helped me locate my fav deodorants way back when I decided to make the switch! Would you happen to know of a great way to PREVENT & TREAT traveller’s diarrehea? I have used probictos and charocoal to no help.. Thank you very much! I love making my own home-made health care products. 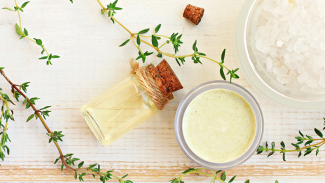 Would you happen to have a recipe for a nourishing eye cream? I’m in my early 50’s and would like to keep my eyes bright and gorgeous! Thank you! Thank you so much for such great ideas! I love learning about kitchen pantry items for beauty. I’m only familiar with cocoa butter in lotion form, but it sounds like Danielle is referring to a raw format? I’ve have been told by a dermatologist that moisturizing your skin is all fine and well but not the same as the anti-age formulas found in skin care products (like the ones they sell). Is this true and is there a natural alternative to anti aging formulas. What great information! Thank you! What would you recommend to reduce the appearance of facial scars? Hi Erin, great question – one close to my heart because many years ago, I fell (badly) during a half marathon and split my chin open! I had to have emergency plastic surgery that left me with a hugely visible scar I thought I would have to live with for the rest of my life. Back then, even though I wasn’t as engaged or interested in natural skincare support or eating only foods that support my wellness, I was desperate to try anything and had great success with liberal application of fresh (chemical-free) aloe vera gel which can succesfully soothe all kinds of damaged skin and also help regenerate skin tissue. Looking forward to reading it! I break out in horrible acne whenever I am exposed to mold…I know crazy, right? We just replaced our mattress and it was laying on 20 year old box springs…..can’t even tell you how disgusting it was…blah! Anyway, boom….massive cystic acne breakout which is finally resolving. So mostly new scars with a few old. I bought some Derma E scar gel but am curious what you would recommend. Thanks!!!! Unfortunately, coconut oil is a no-go for me as it horribly clogs my pores. My best friend lost her hair to chemo and had a dry, itchy scalp. Someone told her to apply coconut oil, which she did. The next morning she woke to a scalp covered with tiny pimples. Evidently. I’m not the only one! Hi Marci, you are not the only one and coconut oil is NOT the cure-all it has been previously marketed as, thanks for highlighting this important factor. I believe anything we choose to put in or on our bodies must be done so based on our own bio-individual needs and reactions. Patch-testing is a great way to ‘taste-test’ something on your skin before adopting a full-on routine using a particular product/ingredient. Thank you Danielle shine for great tips – wonderful addition to KC team we need more of these tips ! Please keep them coming ! Great to find this kind of info! I’m trying to make soap for washing dishes by hand (no electricity,here! ); any ideas? 2) You’re correct, mammals were definitely NOT meant to eat soap! Thanx a lot:going to try this right away!!! I agree that Sweet Almond Oil is really packed with Vitamin E! I have been using it for such a long time now. It really works wonders. I have been obsessed with natural skin care! This write up was so fantastic with a ton of useful information! I have just recently found an ebook with recipes and directions to make your own products and I’m in love! I have acne-prone skin even with cleaning out sugar from my diet, I am a business owner with a ton of stress! My favorite self-care go-to is a turmeric powder, honey and lemon juice mask. This eases my breakouts and brightens my skin. Thanks for sharing your tips, I am definitely going to try the sweet almond oil. So much love and light to you and your team! Hi Kris! It’s a great day to watch and read all of your inspiring and smart tips! I have a question- Do you have any advice for highlighting brown or dark blonde hair naturally? Your locks are soooo pretty!